A question that customers ask on a regular basis is ‘What qualities should I look for in a luxury watch?’ Obviously, this is subjective because all buyers have different preferences and requirements. You should always look at the build quality and where the watch is produced. For example, Swiss timepieces are normally considered a higher standard than their Japanese or Chinese counterparts. It is also important to carefully select the materials used. Certainly precious metals like platinum and gold are very desirable. However, recently some contemporary watchmakers have opted for carbon composites and lightweight alloy metals. Finally, pay particular attention to the caliber powering the watch. A high-end watch should have a refined mechanical manual or automatic movement. Here are a few exclusive timepieces that will appeal to the discerning client. 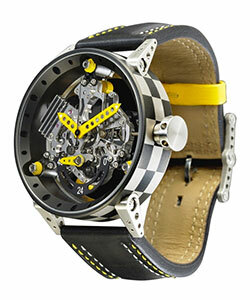 B.R.M is synonymous with the production of racing inspired luxury watches. The R50-TN is a beautifully presented timepiece that is sure to attract a lot of positive attention. Dimensionally the watch has a massive titanium case that measures 50mm. What makes this timepiece so appealing is the superb skeletonized dial with lightweight yellow drilled hour/minute hands. At the heart of the watch is a modified Swiss made ETA A07161 (Valgranges) self-winding movement. 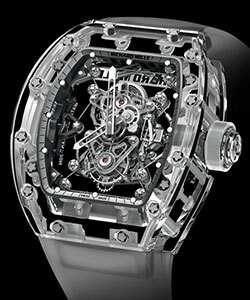 Richard Mille has become famous for his innovative timepieces designed for elite sportsmen and A- list celebrities. 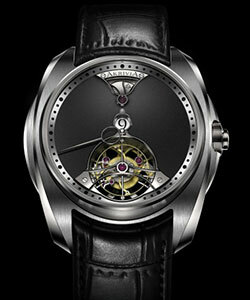 Probably his most exclusive model to date is the magnificent RM 56-02 Sapphire Tourbillon. This watch exudes oversized proportions and measures 50.50mm x 42.70mm x 16.75mm. What makes this timepiece so grande is the sensational handcrafted sapphire crystal case. Powering the watch is a bespoke mechanical tourbillon movement. Get the RM 56-02 Saphire Tourbillon. 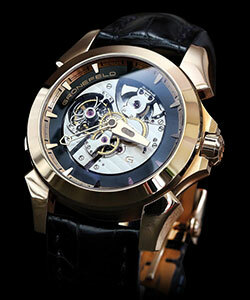 AkriviA is a high-end Swiss watchmaker that is owned and operated by Rexhep Rexhepi. One of their latest and most exciting models is the sublime Tourbillon Chiming Jump Hour. With a resilient brushed steel (30-part) case measuring 43mm x 12.90mm the watch is designed for the watch aficionado. What makes this timepiece so enticing is the elegant matt black steel displaying the exposed tourbillon carriage. Beneath the exquisite exterior lies a complicated manual winding movement containing 275 individual components. Get the Tourbillon Chiming Jump Hour. Grönefeld is a luxury boutique watchmaker that is owned by Bart and Tim Grönefeld. All of their timepieces are exceptionally exclusive including the marvelous GTM-06. This watch has a well-proportioned 18-karat pink gold (or 950 platinum) case measuring 44mm x 15mm. What makes this timepiece really stand out is the open worked dial with black onyx chapter ring. At the heart of the watch is an accomplished mechanical hand winding movement comprising 385 separate parts.